One of NASA's most senior and still-operational spacecraft reached a milestone: the rover Opportunity completed its first 25 miles traveling across the surface of Mars! It's not only a nice round milestone, it's a new off-Earth roving record that breaks the long-standing 24.2-mile mark of the previous champion, the Soviet lunar rover Lunokhod 2. The other contenders in this low-speed race don't even come close: Lunokhod 1 at 6.5 miles, the newest entry Curiosity Mars rover at 5.3 miles (but expected to give Opportunity a run for its money), the Spirit Mars rover at 4.8 miles, Mars Pathfinder/Sojourner at 330 feet, and China's lunar rover Yutu clicking in 317 feet. On Earth twenty-five mile trips are humdrum half-hour hops to your Aunt's house. But for a semi-autonomous, remotely controlled robot exploring a planet millions of miles away, it's simply awesome. In its 10-year trek, Opportunity made a good living crater crawling, trading up with each new hole in the ground it explored. In fact, Opportunity was a craterteer from the moment it landed and rolled into a small pit called Eagle Crater in 2004 --which caused NASA engineers and scientists to hold their collective breath for fear that it might not be able to get out of the hole. But get out it did and Opportunity began its drive across Meridiani Planum, the vast plain it had come to investigate for geologic signs of past water on Mars. Along the way Opportunity traded up to Endurance Crater, a 426-foot impact feature that would be its first intentional crater crawl, and later Victoria Crater, a half-mile impact basin with exposed rock strata along its edge that were prime targets for seeking sedimentary layers that might have been water-laid. Opportunity found ample signs of ancient, extinct waters: gray hematite "blueberry" spherules it found along the way, intricate patterns in sedimentary features it scrutinized with its microscope, and other dry but suggestive clues. After spending almost two years exploring around and below the rim of Victoria Crater, mission directors decided to risk a much longer drive of discovery toward a much larger crater, the 14-mile wide Endeavour. They were not certain that the aging rover would survive the journey, but the potential payoff was considered worth the risk -- plus it was the only way for the rover to trade up to a crater larger than Victoria. It was also during this long march to the horizon that Opportunity's Mars-roving buddy around the planet in Gusev Crater, Spirit, ceased functioning, leaving Opportunity the sole functioning robot on the planet. 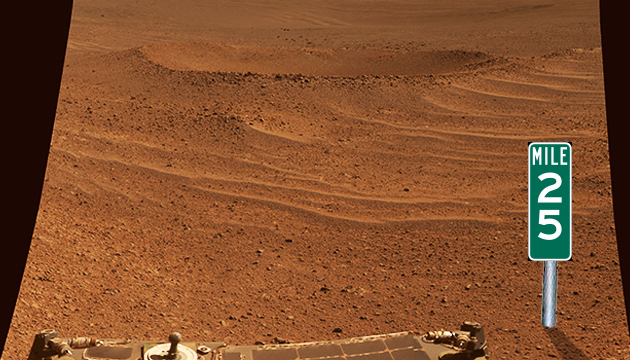 Three years after leaving Victoria, in 2011, Opportunity arrived at the rim of Endeavour where it has been exploring ever since. In its time at Endeavour, the rover has found even more clues pointing to the younger Mars' wetness, including additional detections of hematite, as well as a vein of material containing calcium, sulfur and water that most closely resembles gypsum. The presence of gypsum may indicate past water of more neutral pH, which could indicate an environment that was suitable to nurture life—life as we know it, at least. Opportunity has been joined by the larger, next-generation rover Curiosity, the nuclear-powered traveling laboratory currently exploring the lower layered slopes of Mount Sharp in Gale Crater. And though Curiosity has traveled little more than five miles to date, if it shows even half the pluckiness of its elder Opportunity, we should expect to see another off-world roving record broken sometime in the next few years. Craters, if you haven't guessed, are preferred targets for remote explorations of Mars, and for good reason: impact craters expose Mars' past to our scientific curiosity. The walls of craters are literally stacks of sedimentary geologic history, sheared through and unearthed by the force of the impacts that create them. In the case of Gale Crater, the depression also served as a collection basin for sediment that layered up over hundreds of millions of years and was subsequently exposed by erosion. One day, maybe not far off, distance records like those of Lunokhod 2 and Opportunity and perhaps Curiosity will be dashed the rocks by more sophisticated robotic explorers and even human-driven vehicles. But today the prize and pride belong to Opportunity.